There is an historical precedent for the civilization ending climate crisis we are facing. An extinction event hundreds of millions of years ago has terrifying parallels to modern day climate change. We live in the age of the anthropocene, a time when human activity is decimating life on planet Earth in what is being called the sixth mass extinction event. Around 252 million years ago an extinction event wiped out almost all life on Earth. This includes 70 percent of all vertebrate species and 96 percent of all marine species. 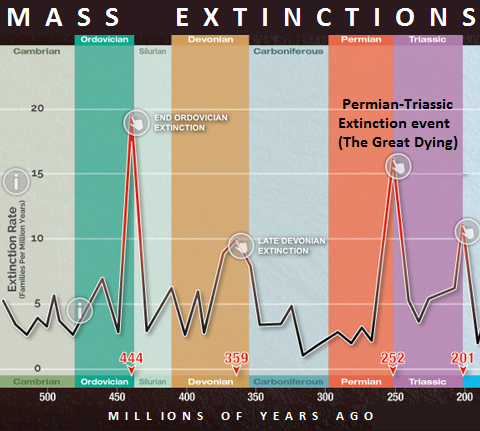 The Great Dying, also known as the Permian-Triassic Extinction event, was caused by climate change. Long term volcanic activity in Siberia is thought to have shrouded the earth in ash, this in turn blocked sunlight, thinned the ozone layer and caused temperatures to rise dramatically. What we see happening today has parallels to the Great Dying the only difference is that it is happening much faster. 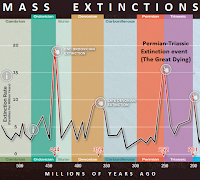 The Permian-Triassic Extinction event took 700,000 years, anthropogenic climate change has occurred in a relative blink of an eye (Just over a century). A buildup of atmospheric CO2 is the cause of the Great Dying and it is the primary cause of the changing climate we are witnessing today. During the Permian-Triassic Extinction event carbon spewed from volcanic discharges and associated events. The current mass extinction is being fueled by humanity. Human activities including the burning of fossil fuels are releasing vast quantities of CO2 into the atmosphere. Although there are disagreements as to levels of atmospheric carbon 252 million years ago, it is widely agreed that atmospheric CO2 levels have not been as high as they are today in at least 800,000 years. According to the most recent computer models the Great Dying virtually eradicated marine by rising sea temperatures which starved the ocean of oxygen. At the same time these warming seas increased the metabolic rate of sea creatures concomitantly increasing their oxygen requirements. The cause of death was suffocation. In the Great Dying animals tried to escape oxygen deficient environments by fleeing. The hardest hit were animals in higher latitudes far from the equator as they had nowhere to migrate to. Some of the animals that lived along the equator could find some respite by migrating to higher latitudes where they could find similar habitats to the ones they left. This is thought to have extirpated half of all the marine extinctions. The rest were caused by ocean acidification and massive reductions in plant life from a thinning ozone. During the Great Dying sea surface temperatures increased by around 11 degrees Celsius (by 20 degrees Fahrenheit) and this depleted oxygen by about 76 percent. The ocean floor was almost entirely without oxygen and sea levels were 100 feet above were they are today. The parallels to today are frightening. Since the dawn of the industrial revolution less than 150 years ago, the earth's temperature has increased by 0.8 degrees Celsius (1.4 Fahrenheit). However, we are seeing accelerated warming with 66 percent of that warming occurring since 1975. "Under a business-as-usual emissions scenarios, by 2100 warming in the upper ocean will have approached 20 percent of warming in the late Permian, and by the year 2300 it will reach between 35 and 50 percent," said oceanographer Justin Penn of the University of Washington. "This study highlights the potential for a mass extinction arising from a similar mechanism under anthropogenic climate change."